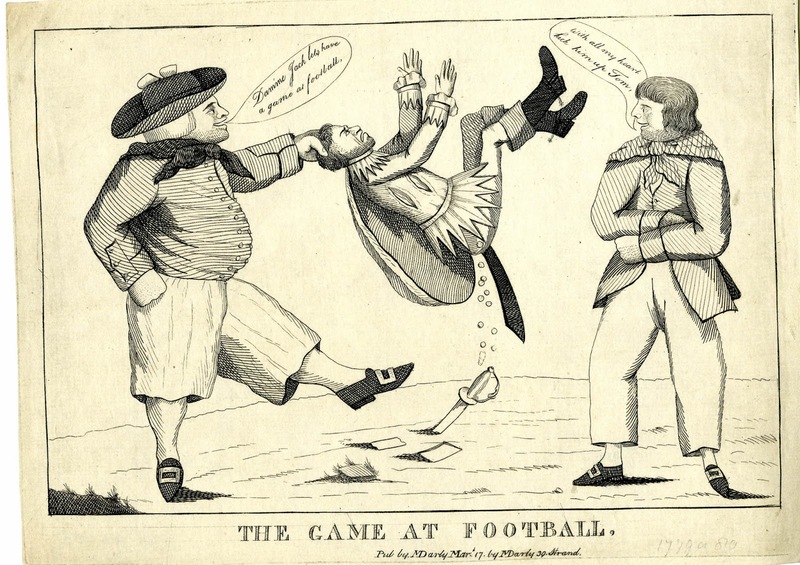 The Game At Football, Matthew Darly, 1780, British Museum. Football is a game that appears here and there in the historical record of the eighteenth century. As just one entertaining example: a British sentry in Boston, during the occupation of 1768-1770, was booted in the head with a football. Unfortunately, I know little about how the game was played or what precisely it involved. 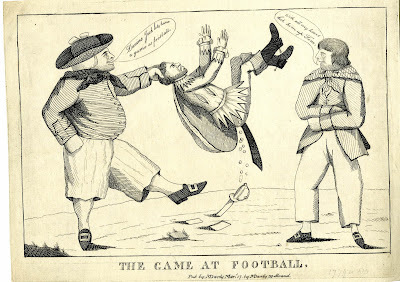 What I can tell you is that this image isn't so much about the literal game as it is about sailors beating on Spaniards (a common theme for political cartoons, as we've seen). The Spaniard is flying up into the air from a solid kick to the backside, and gold spills from the pockets of his archaic pantaloons. 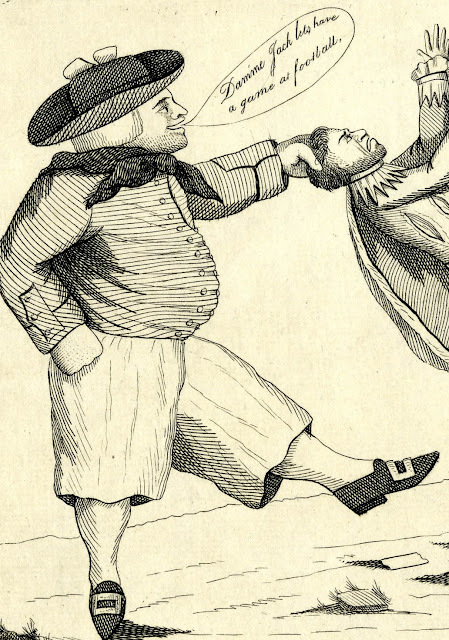 Political cartoonists were always fond of portraying the Spaniards as wearing wildly outdated clothing. Clutching the hair of the Spaniard and giving him the boot, a sailor named Tom smiles with delight. He wears a wide brimmed round hat with a bow on the left side. A wide neckcloth is tied about his neck, draped over his single breasted jacket. The cuffs are slash with a flap and closed with what appear to be cloth covered buttons. Tom's slops and stockings are both white, and he wears the familiar pointed toe shoes with rectangular buckles. His mate, named Jack, crosses his arms but looks on with obvious delight. He wears no hat, but a plaid patterned neckcloth over his jacket. Jack's cuffs are a bit wider and more pronounced than most sailors, matching that of Tom. His trousers are white and end well above the ankle, where his stockings, shoes, and buckles match that of Tom.